Just because you don’t have a huge pantry doesn’t mean you can’t stockpile! Not everyone has a full basement or a room that they can commit to storing their stockpile items. You may have very little space to keep your stockpiled items so you have to plan to cleverly store your stockpile without making your home look like that 1950s bunker we mentioned! But first, let’s talk about using your stockpile. Ingenuity can lead to so many brilliant stockpiling storage ideas. Part of maintaining a stockpile is knowing what you have on hand and using it. Keep your stockpile organized. Keep a list of what you bought and how many/much you have on hand. And you need to know how long food stores and how to store it. There are great articles here, here and here (for more long term planning goals) on proper food storage. No matter when you buy your stockpile items, you have to have a plan to rotate. You don’t want to to invest your time and money into building a stockpile only to have it go bad sitting on your shelves. Always pull the older items to the front and put the newer items toward the back. When you plan your meals, consider your stockpile before you go on your weekly grocery run. Use what you can and replace older stockpile items with newer ones. 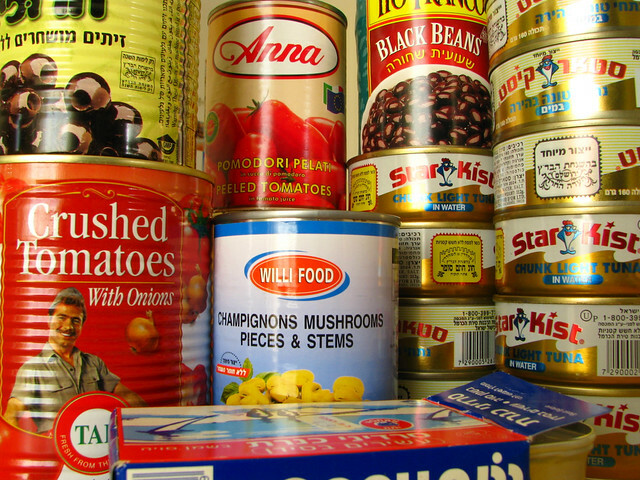 Rotate your canned food to make sure you don’t let anything expire. Every can of food sold in the United States has an expiration date. In order reduce the amount of food you lose to expiration, keep your canned items sorted by the type of product (beans, veggies, mixed veggies, fruit, meat, etc) and then by expiration with the oldest products closest to the front. Food grade buckets are essential for stockpiling and don’t have to cost a fortune. For dry goods, I recommend starting out with your freezer. I chose to purchase flour by the bag so I can get the brand I want. When I bring it home, I place it in the freezer for a few days to kill off any bugs that may be living in there. Some say this doesn’t work but I’d rather be safe than sorry. If you have the room, you can leave your stockpile items in there. If not, I suggest food grade buckets. These can be purchased online but ask your local bakery first. They may have some old icing buckets they’ll give you or sell for a song. For short term storage (a couple of months), I’ve always used food grade buckets with lid. We use a lot of flour so this works for me. If you want longer term storage, you need to package your dry goods properly using buckets lined with mylar bags and oxygen absorbers. Glass jars are perfect for short-term bean and rice storage! 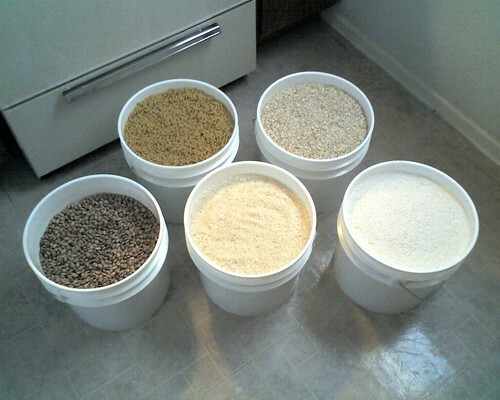 Dried beans and rice can be stored for long periods of time in food grade buckets. in the bags you buy them in! I’ve also found large glass canning jars to be advantageous (and pretty!) for storing rice and beans. Don’t forget to store your spices properly! Spices are best left in their original containers and stored in a cool, dry place. If you’re drying your own herbs, its important to get them as dry as possible and then package them with as little air as possible. Mylar bags allow you to stretch your food storage long-term. For longer term storage, you might consider purchasing mylar bags to extend the life of your stockpile items. You’ll also need oxygen absorbers to pull oxygen out of your storage buckets. Gamma lids are a stockpiler’s best friend. Gamma lids are a lifesaver. How many times have I ripped the skin off of my fingers trying to pull the lid off of a bucket lid that I may have used as step stool? Gamma lids snap onto your buckets and then have screw-tops for easy access. This bucket tool is AWESOME and handy! There’s also this bucket opener tool that looks quite handy. You can make nearly any space work for stockpiling. Smaller spaces means the need for clever storage. First, check all of your closets and clear out any unnecessary clutter. That top shelf full of old sheets can be re-purposed to store extra paper products or your canned meat products in a tidy tub. 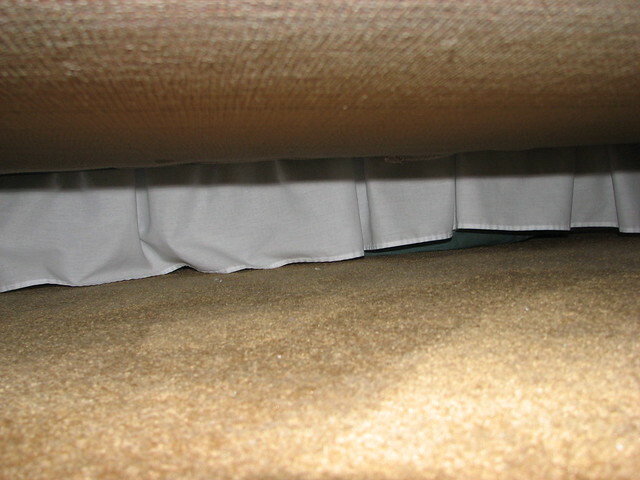 Consider that empty space under your bed where the dust bunnies and elusive missing socks live. Purchase a few of those plastic sweater boxes and you have the perfect spot for more canned goods. Food grade buckets can be stacked up in the corner of a closet or under basement stairs for longer term storage. I hope this article pointed you in the right direction for your stockpile storage! Grandma has several articles with great links to more about stockpiling. Be sure to check those out too as you decide how to store your growing frugal stockpile. Where do you store your stockpile? I’d love to hear more about your stockpiling methods in the comments! Hi, I love your idea for storing canned goods in the metal magazine rack! Where did you get that particular rack? Thank you! The magazine holder was one that was originally purchased from HomeGoods. However, these cans are not traditional size, they are the “little” cans that are about half the size of regular cans. There are definitely wider magazine holders at various stores but I am not certain they would fit traditional cans either.